At Telematics 2016 Gurtam announced the new solution for public transportation tracking, and this is what we started from: a few ideas, a general concept, and a motivated team. After a year of comprehensive analytics, non-stop development and testing we are ready to present NimBus – the new solution to control vehicles on the route designed with due consideration to expert opinions, partners’ ideas and the analysis of multiple projects in the area. How will passenger transportation change after NimBus implementation? What to expect from the new solution and why start using it today? Find the answers in the article below. Gurtam operates in 130 countries worldwide and each region has its own preference for the cutting-edge solution. Some partners demand simple off-the-shelf software, while others value flexibility and extended functionality to create the most suitable solution for their projects. When creating NimBus we were trying to strike the right balance – not to overcomplicate the service while making it more than just “basic”. The solution combines the core functionality of satellite monitoring system and a special tool for public transportation control. Let’s have a closer look at NimBus and its advantages. To start working with the service, add the new app from the library and authorize in NimBus. Activate a "Depot" for one of your lower-level accounts and continue working under the sub-account. Good luck! Starting to manage an average bus fleet? Create stops in one click on the map or set its exact location in address search field. Made a switch to NimBus from another system and have a database ready to use? Import it from .kml/.kmz file and keep on working in the new service. Create waypoints of any shape to ensure their visiting even on the most complicated junctions. 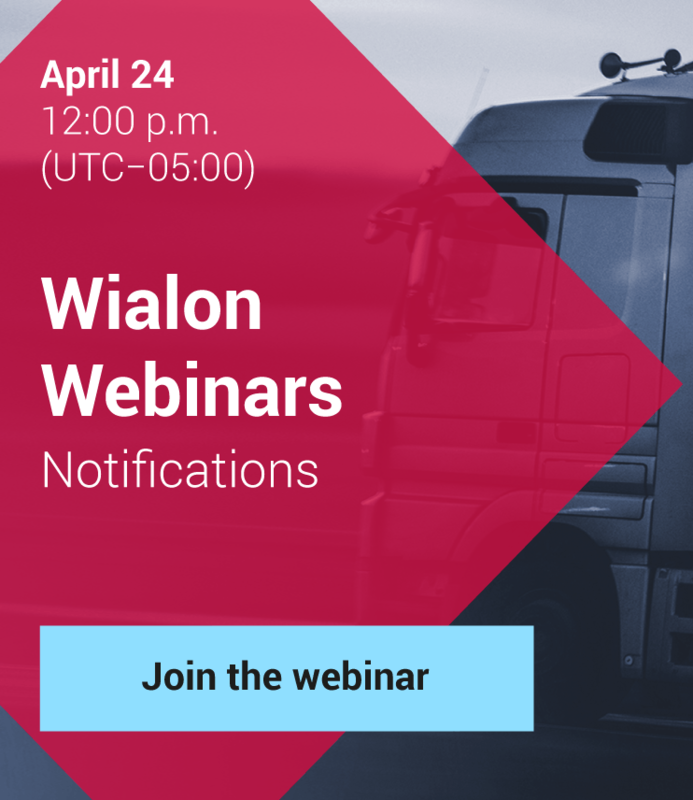 Specify transport vehicle type for advanced filtration and search in the list and on the map. Add a detailed description to differentiate between stops in opposite directions. Get quick access to the stop on the map while working with the list. In NimBus a route is a sequence of stops. For their visiting, you need to add schedules, assign units and set operational patterns. The latter activate routes only in the specified days and allow to create individual working schedules for each route and fleet. Use dynamic search and filtration by vehicle type. Change waypoints order using drag&drop approach. Fill in route description to differentiate between temporary, standard, direct, holiday, and return routes. Add from one to several hundreds of schedules depending on weekdays, seasons, road works periods and other conditions. Save dispatchers’ time by specifying the units traditionally following the route in advance. The route is created. Quickly. Let’s proceed to the rides. After adding schedules and activating routes we come over to rides planning. 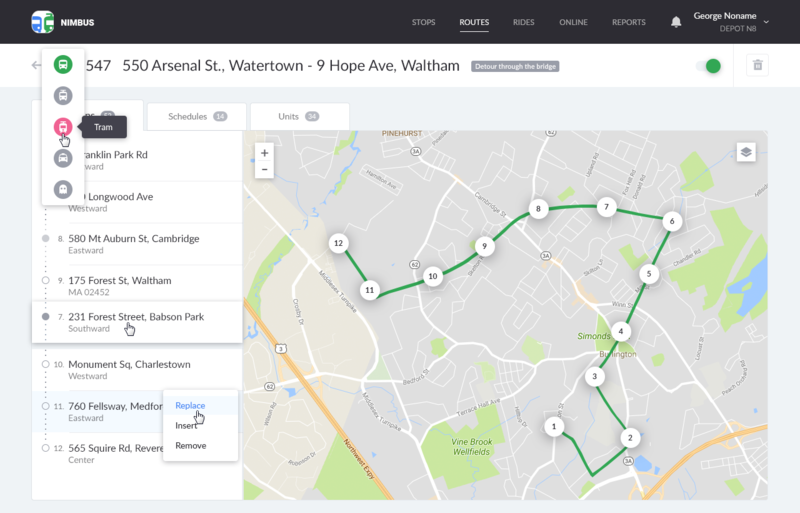 When the route is active, rides based on its schedules are created automatically. 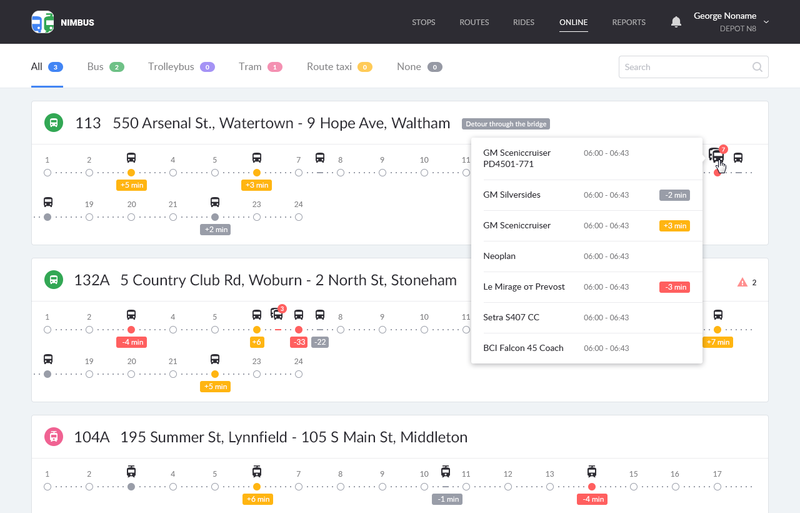 Rides can be grouped by a route/unit or filtered by vehicle types and assignments. View planned rides for any date and manage rides within the following week. Study the core information on the ride in a user-friendly style. Use dynamic search and filtration to identify rides with no units assigned. Real-time ride performance control is simple.Despite the specifics of dispatcher operations we never abandon unit tracking on the map. At the moment there're three GIS sources available in NimBus. Specifically for dispatchers, we implemented a handy timeline and quick notifications to control late/early arrivals, deviations from the route and other circumstances demanding the immediate reaction. Avoid clusters of vehicles on the route by ensuring the uniformity of their distribution. View detailed information on stops and units when pointing at the corresponding elements. Make use of color identification when analyzing late/early arrivals. Check geographically correct unit locations on the map. Moreover, we added an option to replace a vehicle on the already started ride. That way you’ll continue tracking in the shortest possible time even if there was a breakdown on the route. Reports ensure access to rides history and performance quality assessment in terms of routes and units. The analytics allow to further optimize the operations of passenger transportation services. Generate basic and detailed reports. Execute reports for the intervals of up to 100 days. Combined functionality of the core Wialon modules (routes, monitoring, reports, geofences) in a handy interface. 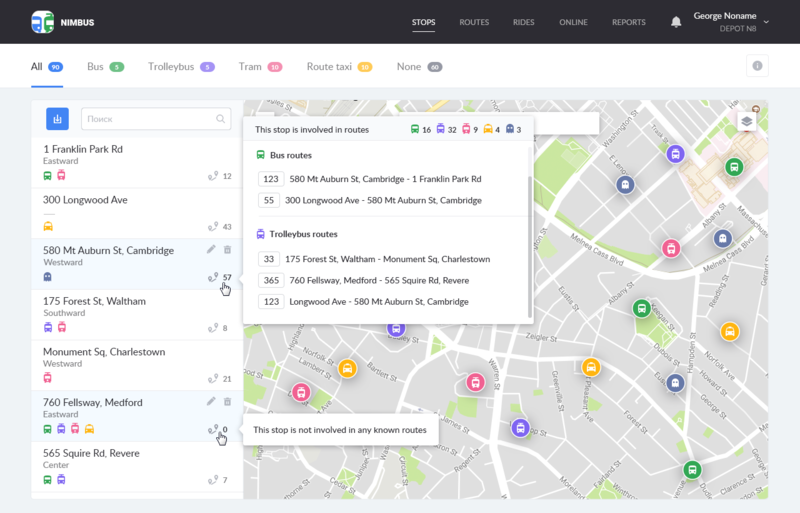 Intuitive navigation to perform a wide range of tasks in the area of public transportation. Flexible configuration and access rights system. On the day of NimBus release, we also announced the development of API highly anticipated by our partners. After only two weeks, 04.10.2017, the solution for passenger transportation tracking was supplemented with the proprietary API for you to extend its functionality subject to your business needs. Now you can integrate with third-party systems and applications, create custom NimBus-based developments, get access to data in the new solution, and import/export large volumes of data in various formats. Learn more about how to start using API in the detailed documentation. Rides grouping to manage large fleets. Handy Dashboard to quickly assess fleet activity. Advanced usability for schedule creation. On the day of its release, NimBus has already acquired the first users and even projects. Start using the new solution now and leave your ideas and suggestions on our forum. The more feedback we receive – the more advanced solution you get.